Oceans drive the world's climate, nurture marine ecosystems full of aquatic life, and provide shipping lanes that have defined the global economy for centuries. Yet they are increasingly threatened by human activities such as commercial fishing, coastal real estate development, and industrial pollution. Published this month by the University of Chicago Press, The Atlas of Coasts and Oceans by Don Hinrichsen documents the fraught relationship between humans and the earth's largest bodies of water—and outlines the conservation steps needed to protect the marine environment for generations to come. The Atlas offers a fascinating and often sobering account of how urbanization, climate change, offshore oil drilling, shipping routes, global tourism, and maritime conflict have had a profound impact on the world's oceans and coasts. Combining text and images in visually engaging, thematically organized map spreads, this volume addresses the ecological, environmental, and economic importance of marine phenomena such as coral reefs, eroding shorelines, hurricanes, and fish populations—and how development threatens to destroy the ultimate source of all life on the "blue planet." Lavishly illustrated with global and regional maps, from the Arabian Gulf to the Great Barrier Reef, from the Black Sea to the Mediterranean, and all the other major global waterways, The Atlas of Coasts and Oceans will be the definitive companion to any study of its subject for years to come. About the author: Don Hinrichsen is the author of many books on the environment and development, including Coastal Waters of the World, Our Common Future, and The Atlas of the Environment. Now senior development manager at the Institute of War and Peace Reporting in London, he has worked with UN agencies, governments, and NGOs in some sixty developing countries. A three dimensional survey of the spot where the MV Clipper Adventurer was grounded. The Canadian government is facing a multimillion-dollar lawsuit from the owner of a cruise ship that became stranded in the Northwest Passage last summer, CBC News has learned. Adventurer Owner Ltd. of Nassau, Bahamas, is seeking at least $15 million US for costs related to its cruise ship, MV Clipper Adventurer, running aground on Aug. 27, 2010, according to a statement of claim that has been filed with the Federal Court. 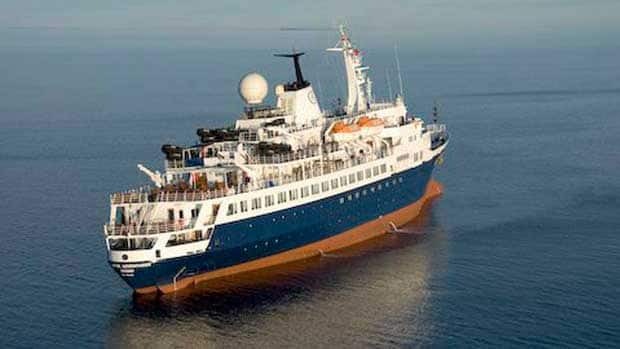 The Clipper Adventurer was ferrying 128 passengers through the Arctic passage when it struck an uncharted rock shelf in Coronation Gulf, near Kugluktuk, Nunavut. No one was injured, but the passengers and crew were forced to stay on the stranded ship for almost two days until a Canadian Coast Guard icebreaker arrived to take them to Kugluktuk. The passengers were customers of Adventure Canada, a tour operator that had chartered the Clipper Adventurer for the Arctic cruise. It took more than two weeks before the cruise ship was refloated on Sept. 14, 2010, according to Adventurer Owner's statement of claim. The company claims that the ship was seriously damaged, and it was taken to a shipyard in Poland for repairs in November and December. The damages Adventurer Owner is seeking from the federal government includes $12 million in repair and salvage costs related to the ship's hull, $2.6 million for loss of business, and $350,000 in other costs. The company says the federal Department of Fisheries and Oceans failed to inform mariners about the rock shelf, which the department has known about since September 2007, according to the statement of claim.The nautical charts the Clipper Adventurer's captain had on board indicated there were 29 metres of water in that spot, when there were only three metres, the company claims. Federal officials "failed to put in place and maintain, or to take reasonable steps to put in place and maintain … any reasonable system for disseminating such information," the company's claim states in part. None of Adventure Owner's allegations have been proven in court. The federal government has not yet filed a statement of defense. Another massive winter swell hit Sydney's coast over the last week generating monster sized waves putting on an impressive display of power and beauty along the coastline. People spend hours and hours perched atop the cliffs at Bronte (pronounced Bron-tee) marvelling at the sheer power of the waves crashing to shore whilst observing surfers taking on the big swells. What do people think about as they look out onto the huge swells rolling in and crashing up against the shore? Always wondered.... and how therapeutic it is for so many people. As it was a southerly swell generated by a huge low pressure system off Tasmania only a couple of Sydney's city beaches are rideable for the surfers - Bronte, my favourite beach and local, being one of them. The group of 12 underwater mountains lies south of the South Sandwich Islands — desolate, ice-covered volcanoes that rise above the southern Atlantic Ocean about halfway between South America and South Africa and erupted as recently as 2008. It's the first time such a large number of undersea volcanoes has been found together in the Antarctic region. The peak in the foreground is thought to be the most active, with eruptions in the past few years. "We knew there were other volcanoes in the area, but we didn't go trying to find volcanoes," Leat told OurAmazingPlanet. "We just went because there was a big blank area on the map and we had no idea what was there; we just wanted to fill in the seafloor." Leat said the images of the seafloor appear before your eyes on screens as the ship moves through the water. "So it's very exciting," he said. "You go along and suddenly you see the bottom start to rise up underneath you, and you don't know how shallow it's going to get." At one point, in the dead of night, the team encountered a volcano so large it looked as though the RRS James Clark Ross, the team's research vessel, might actually crash into the hidden summit. "It was quite frightening, actually," Leat said. The researchers stopped the ship and decided to return in daylight. The onboard instruments revealed that some of the peaks rise within 160 feet (50 meters) of the ocean's surface. The missing parts of the image are where islands blocked the research vessel's mapping sonar. Leat said their conelike silhouette is a dead giveaway. "There's no other way of getting that shape on the seafloor," he said. In addition, the researchers dredged up rocky material from several peaks and found it rife with volcanic ash, lumps of pumice and black lava. Leat's biologist colleagues discovered some interesting creatures living in the hot-spring-like conditions near the underwater mountains, and news on that will be forthcoming, Leat said. Despite the frozen, isolated conditions, Leat said the expeditions were far from boring. Each moment, a hidden world never before seen by humans unfolded before their eyes. 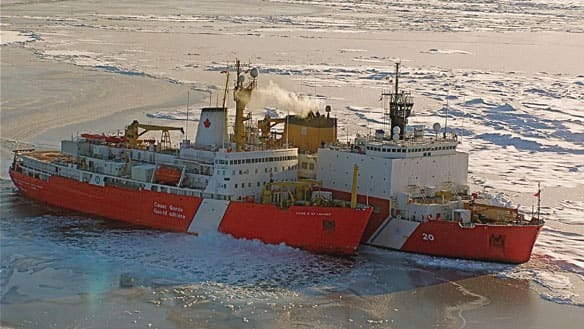 A Coast Guard vessel is heading to the Arctic where scientists will map out another section of the continental shelf, staking out the undersea territory and resources that belong to Canada. The Louis St-Laurent will be accompanied on its four-month mission by the United States Coast Guard cutter Healy. This is the fourth year that a Canadian ship has spent mapping the shelf that lies below the Arctic waters to determine where it extends beyond the limit of 200 nautical miles from shore over which Canada already has exclusive jurisdiction to exploit and explore. The aim is to have complete data to present to the Commission on the Limits of the Continental Shelf by December 2013. The commission was struck in 2003 under the United Nations Convention on the Law of the Sea, which Canada ratified in 2003. The UNCLOS uses a complicated formula based upon the geological characteristics of the sea floor to determine the outer limits of national boundaries beyond the 200-mile limit. Fisheries Minister Keith Ashfield said in a release issued Monday the Arctic is a strategic piece of Canada’s future that must be sustained and protected. “The Canadian Coast Guard, its exceptional fleet and skilled personnel are instrumental in our government's successful arctic missions as they lay the groundwork for our Northern Strategy,” Mr. Ashfield said. The Department of Fisheries and Oceans is conducting the survey in collaboration with the Ministry of Natural Resources. In addition to providing a platform for the scientific work, the Louis S. St-Laurent will provide assistance to commercial shipping, which becomes viable during the summer months. It will also support a multi-national project studying the oceanography of the currents in the Beaufort Sea to understand accumulation and release of fresh water, as well as to enhance understanding of environmental change in the Arctic. The ship is not expected to return back to Newfoundland until Nov. 18. NOAA will use the data to update nautical charts to help mariners safely navigate this important but sparsely charted region, which is now seeing increased vessel traffic because of the significant loss of Arctic sea ice. Fairweather and her survey launches are equipped with state-of-the-art acoustic technology to measure ocean depths, collect 3-D imagery of the seafloor, and detect underwater hazards that could pose a danger to surface vessels. The ship itself will survey the deeper waters, while the launches work in shallow areas. The city of Kotzebue, located on the shores of Kotzebue Sound at the tip of Baldwin Peninsula, serves as a supply hub for eleven Arctic villages and cannot currently accommodate deep draft vessels. Those vessels must now anchor 15 miles offshore, and cargo is brought to shore by shallow draft barges. This summer’s survey will also address a request for bathymetry to support navigation and installation for an offshore lightering facility used for heating and fuel oil. An up-to-date NOAA chart, using data acquired from surveys with modern high-resolution sonar technology, can improve the efficiency – and safety – at this important location. Modern U.S. navigational charts are the best in the world, and are updated regularly by NOAA’s Office of Coast Survey. However, they are only as good as the data available, and many of the soundings on today’s Arctic charts were acquired in the 1800’s with a weighted lead line, an antiquated technique. In addition to surveying critical areas with modern multibeam sonar technologies, NOAA has initiated a major effort to update nautical charts that are inadequate for today’s needs, such as the deep draft vessels looking to exploit an open trade route through the Arctic. 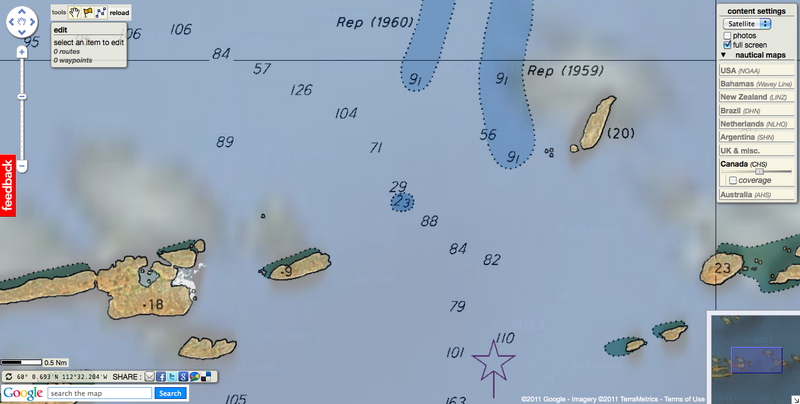 NOAA’s Arctic Nautical Charting Plan, issued last month, prioritizes charts that need updating. “NOAA’s Arctic surveys and charting plan identify the additional hydrographic coverage necessary to support a robust maritime transportation infrastructure in the coastal areas north of the Aleutian Islands,” said NOAA Corps Capt. Doug Baird, chief of NOAA’s Marine Chart Division in the Office of Coast Survey. Fairweather, one of NOAA’s three ships dedicated to hydrographic surveying, is part of the NOAA fleet of research ships operated, managed and maintained by NOAA’s Office of Marine and Aviation Operations, which includes commissioned officers of the NOAA Corps, one of the seven uniformed services of the United States, and civilian wage mariners. The public can track the ship’s progress by visiting the NOAA Ship Tracker. While exploring Australia's Great Barrier Reef, professional diver Scott Gardner heard an odd cracking sound and swam over to investigate. What he found was a footlong blackspot tuskfish (Choerodon schoenleinii) holding a clam in its mouth and whacking it against a rock. Soon the shell gave way, and the fish gobbled up the bivalve, spat out the shell fragments, and swam off. Fortunately, Gardner had a camera handy and snapped what seem to be the first photographs of a wild fish using a tool. Tool use, once thought to be the distinctive hallmark of human intelligence, has been identified in a wide variety of animals in recent decades. Although other creatures don't have anything quite like a circular saw or a juice machine, capuchin monkeys select "hammer" rocks of an appropriate material and weight to crack open seeds, fruits, or nuts on larger "anvil" rocks, and New Caledonian crows probe branches with grass, twigs, and leaf strips to extract insects. In addition to primates and birds, many animals, including dolphins, elephants, naked mole rats, and even octopuses, have shown forms of the behavior. Tool-using fish have been few and far between, however, particularly in the wild. Archerfish target jets of water at terrestrial prey, but whether this constitutes tool use has been contentious. There have also been a handful of reports of fish cracking open hard-shelled prey, such as bivalves and sea urchins, by banging them on rocks or coral, but there's no photo or video evidence to back it up, according to Culum Brown, a behavioral ecologist at Macquarie University in Sydney, Australia, and a co-author of the present paper, to be published in a forthcoming issue of Coral Reefs. The tuskfish caught on camera was clearly quite skilled at its task, "landing absolutely pinpoint blows" with the shell, Brown says. A scattering of crushed shells around its anvil rock suggests that Gardner didn't just stumble upon the fish during its original eureka moment. In fact, numerous such shell middens are visible around the reef. Blackspot tuskfish, members of the wrasse family, are popular food fish, so it's surprising that its shell-smashing behavior has remained unknown, Brown says. "My feeling is that when we go out and really look for it, it'll turn out to be common." "I absolutely loved it," says ethologist Michael Kuba of the Hebrew University of Jerusalem of the finding. Last year, Kuba and two colleagues documented stingrays in a laboratory forming jets of water with their bodies to flush food out of a pipe. But solid external objects like rocks are harder to dismiss as tools than water jets, Kuba says, and examples from the wild avoid concerns about whether a behavior elicited in the lab is "natural." Primatologist Elisabetta Visalberghi of the Institute of Cognitive Sciences and Technologies in Rome is less convinced. Visalberghi, who documented the hammer-wielding monkeys, adheres to a stricter definition of tool use that requires the animal to hold or carry the tool itself, in this case the rock. "The form of tool use described [in tuskfish] is cognitively little demanding and present in a variety of species. Often it has been labeled as proto-tool use because the object used to open the shell is still, fixated to the sea bottom, and not portable as stone tools used to crack open nuts by chimpanzees or capuchin monkeys are," she writes in an e-mail. Seagulls dropping shellfish onto hard surfaces to crack them or lab rats pushing levers to get rewards would join tuskfish in the category of proto-tool—but not true tool—users. Brown acknowledges that exactly what constitutes tool use is controversial. But he argues that it's not logical to apply the same rules to fish as to primates or birds. For one thing, fish don't have anything but their mouths to manipulate tools with, and for another, water poses different physical limitations than air. "One of the problems with the definition of tool use as it currently stands is it's totally written for primates," he says. "You cannot swing a hammer effectively underwater." Springerlink : Tool use in the tuskfish Choerodon schoenleinii? We all rely on charts to navigate at sea - but are we missing essential information? A mass of data is included on each chart and deciphering the many symbols and abbreviations can be complicated. The accuracy of some charted depths can be trusted entirely while others should be treated with caution. This book will tell you where to find - and how to understand - this vital knowledge. 'Understanding a Nautical Chart' from Paul Boissier explains how charts are compiled before guiding you through the elements that make up these vital navigational tools. In addition to a wealth of practical advice there is a key to all the chart symbols and abbreviations. Navigation and charts fascinate novice and experienced seamen alike, and this book is the easiest way to gain an immediate and clear understanding of the wealth of information available on a nautical chart. There is a full explanation of how to establish the accuracy of charts to allow you to navigate with confidence and safety. Learning the abbreviations and symbols are critical to anybody using a chart and before you can use one, you must know them or at have easy access to the definitions, all of which are included in a full copy of the key to UKHO charts (Chart 5011). 50 pence from the sale of each book will be donated to the RNLI. Alphabetical Index: Index of Abbreviations, International Abbreviations, List of Descriptors, IALA Maritime Buoyage.